NPF 2015 has given us a treat this Monday. See all the acts headed to San Francisco from February 20-March 1 right here. Noise Pop Festival 2015 released a killer lineup for it’s 22nd year. 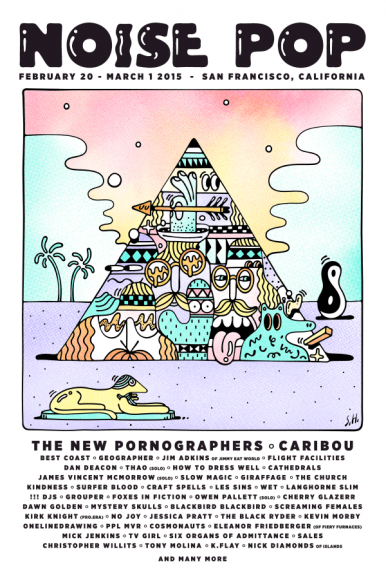 Some noteworthy acts set to play this February/March include The New Poronographers, whose album Brill Bruisers had us talking last year, Caribou, who was just awarded Essential Mix of the Year by Mixmag for 2014, and Screaming Females, whose new album Rose Mountain is scheduled to be released on February 24. Established in 1993 in San Francisco, CA, the indie music festival boasts major past acts such as The White Stripes, Feist, Allah-Las, Sleigh Bells, and ASTR just to name a few. We’ll see you there this year from February 20-March 1.